Hi! My name is Laur (AKA laurbits) and I write, draw and self-publish comics. 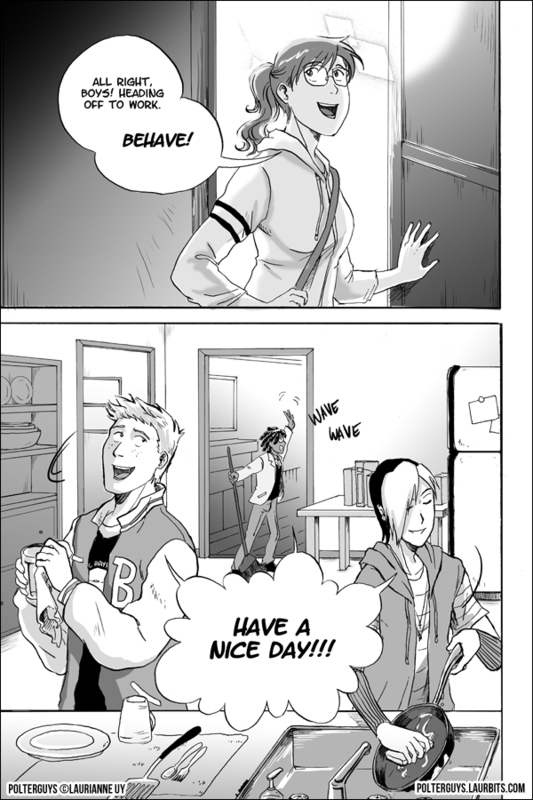 I'm currently working on a manga-inspired series called Polterguys and I've been sharing it online as a free webcomic which you can read here. The first volume received one of the final Xeric grants and was successfully Kickstarted and printed in 2012. I've been able to attend conventions, meet wonderful artists and meet many new fans all over the country because of this comic and I'd love to see it through to completion. Vol. 2 is in the process of being finished. I've been working on it between my day job, ongoing art classes and freelance projects. It can be a huge challenge for a one-person operation like me to keep at it but with your help, I can create pages more regularly and share even more behind-the-scenes processes. You can read reviews, interviews about me and even more Polterguys-related stuff over here. I would relish the opportunity to work on shorter comics and stand-alone books, as well. I have other ideas I would love to share and with your help, we can make that happen! If you can't support me right now, you can always tell a friend about this project, share this page on social media, pledge in the future or buy the comics when they come out. Please be sure to check out the patron FAQ for more info about how Patreon works. Thank you very much for checking out my page! My heartfelt gratitude and access to the patreon activity stream! You will also have FREE access to Polterguys supplementary PDFs whenever they come out. The rewards above and you will get free PDF copies of Polterguys books and any new comics I decide to put up on Gumroad. All the rewards above and you will be included in a monthly lottery for a personal digital sketch of (nearly) anything you want. I can prioritize Polterguys pages every week and make sure I can complete one full page to publish every Tuesday until Vol. 2 gets finished!